This annual event is held at the Airstream, Inc. factory in Jackson Center, Ohio with the support of Airstream Life magazine and other sponsors, this is five days of fun for all Airstreamers! 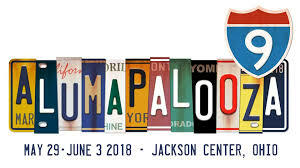 This year’s Alumapalooza will be held May 29 – June 3, 2018. Start planning now! I had the pleasure of attending Alumapalooza last year. It is a very exciting environment and the people are the most friendly I have ever met. There are events scheduled for each day such as seminars, entertainment, door prizes, gifts, a group meal, unlimited socializing, and of course factory tours. Let’s not forget the camping with other airstreamers for five days! Even though this is an Airstream event, any and all brands of RVs are welcome. If you’re interested enough to attend an Airstream event, you will probably be among the Airstream community…one day! Attending Alumapalooza is a fantastic way to learn about the community that owning an Airstream creates and just about Airstreams, in general. To stay up-to-date on Alumapalooza, you can sign up to be on Airstream’s mailing list by clicking this link – http://alumapalooza.com/newsletter/ – you can unsubscribe at any time. You can also like the Alumapalooza Facebook Page – https://www.facebook.com/alumapalooza/?fref=ts and/or follow Alumaevents on Twitter – https://twitter.com/alumaevents. These are all perfect ways to stay current on Airstream events, information, and even connect with other Airstreamers! If you would like to attend Alumapalooza, just visit the registration page here.